The 22nd Cardiff Scouts are bidding to bag a massive cash boost from the Tesco Bags of Help initiative. Tesco have teamed up with Groundwork to launch its community funding scheme, which sees grants of £4,000, £2,000 and £1,000, raised from carrier bag sales in Tesco stores, awarded to three selected local community projects. 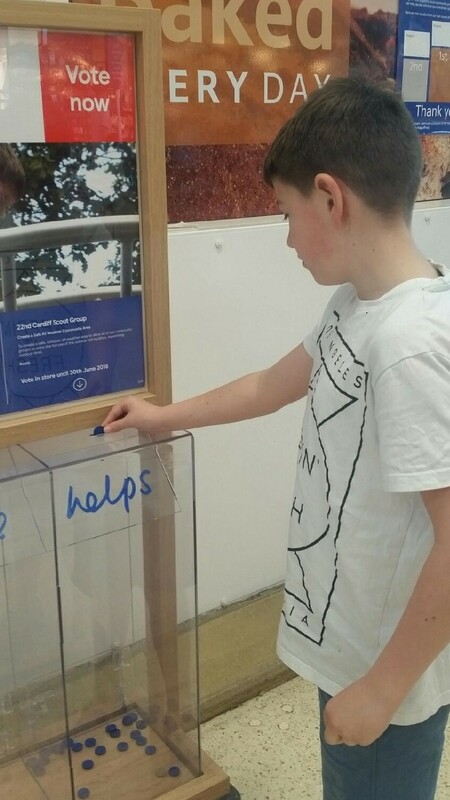 The scout hall’s application to the Tesco’s Bags of Help Grant Scheme has been successful, and now the group’s much needed safe, all-weather outdoor activity area is up for the customer vote in store throughout June 2018. As a non-profit charity the Scout Group need as much help as possible to raise £5,000 for a safe, outdoor, all-weather area for Beavers, Cubs, Scouts, Explorers and all other community groups to enjoy the full use of the outside facilities ensuring maximum outdoor time. TO VOTE: YOU WILL RECEIVE 1 TOKEN FOR EVERY TRANSACTION – EVEN IF IT IS ONLY FOR A SINGLE ITEM !